Find out why these stocks have done well despite their low share prices. Many investors think of stocks with low share prices as being inferior to higher-priced stocks. Yet even though you'll find plenty of penny stocks that have no realistic probability of becoming successful, some promising companies simply keep their share prices relatively inexpensive. Below, we'll take a look at three stocks you can pick up for $5 or less per share that have produced market-beating returns over the past year to see whether they still have any potential gains left for the future. Genworth Financial (NYSE:GNW) has seen its share of volatility this year. After having lost more than half of its value in the first couple of months of 2016, Genworth has subsequently tripled, producing an overall net gain of more than 30% so far year to date. Genworth just barely makes it into this list with a share price a few pennies below the $5 mark. Genworth has seen huge ups and downs in the years since the financial crisis, with the company's traditional line of mortgage insurance products almost causing its downfall. More recently, though, CEO Tom McInerney has worked hard to have Genworth divest itself of non-core assets and discontinue unprofitable business like traditional life insurance and fixed annuities. Now that the housing market has recovered and continues to boom, Genworth's fundamental exposure looks more favorable than ever, and that could keep driving excitement for the stock in the future. 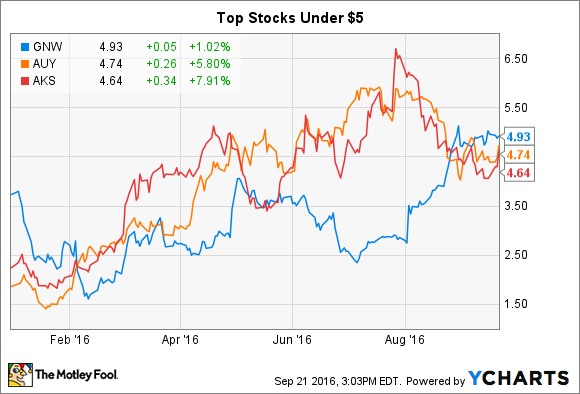 The precious metals markets have found new life in 2016, and Yamana Gold (NYSE:AUY) has been a big winner in the space. Since the beginning of the year, Yamana has soared by more than 150%, easily outpacing not only the rise in the price of gold but also the majority of most of its gold-mining peers as well. Yamana has benefited from fundamental strength in its mining operations as well as from favorable market trends. Earlier this month, Yamana said that its exploration program at its key Chapada site suggests a much larger system of valuable gold and copper assets than previously believed, and positive results at its Jacobina and Gualcamayo sites are also encouraging. Combined with low-cost advantages that include all-in sustaining costs of less than $1,000 per ounce, Yamana has the ability to thrive even when other miners find it difficult to turn a profit. The steel industry has gone through tough times for years. Yet even though construction activity has been weak for a long time, AK Steel (NYSE:AKS) has climbed back recently, with its stock doubling since the beginning of 2016. After a long period of low steel prices, AK Steel is finally starting to see the potential for a market bottom. Low raw material costs have helped the company hold its own even in tough times, but now, the steel industry appears to be seeing more favorable trends emerge. Skeptics still point out that demand for sheet metal and other steel products could stay under pressure into 2017. Yet AK Steel had seen its stock fall so far in past years that its shares finally represented a good value. Longer term, barring a more extensive disruption hitting the entire steel industry as a whole, AK Steel is in a good position to benefit from the next cyclical upturn. Many investors avoid all stocks that trade at low share prices. Yet by separating out solid companies from penny-stock scams, you can drill down on stocks that deserve your consideration and could easily climb out of the sub-$5 range in the near future.